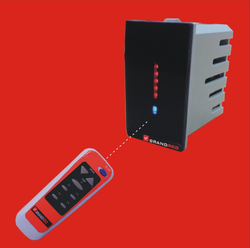 Red Single Module Electrical Glass Touch Fan Regulator. - Single module glass touch fan regulator : 230 VAC/ 10 Amp. - Self learning IR remote. - Directly replaces single module electrical fan regulator. Current Rating (Amps): 6/16 Amp. same look like modular switch, so can be used in place of normal Fan regulator or dimmer switch for incandescent bulb/lights. It have three speed/dimming level with color change LED indication. -Stylish modular design (Anchor Roma). -Support load upto 400W. 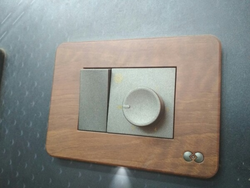 We are offering Touch Fan Regulator to our client. Leveraging the skills of our qualified team of professionals, we are instrumental in offering a wide range of Touch Screen Fan Regulator. As per the distinguished and changing requirements of our customers, we have come up with a huge collection of Murano Electronic Touch Fan Regulator . Backed by the team of highly dedicated professional and years of experience in the domain, we are engaged in offering a quality range of Havells Murano Electronic Touch Fan Regulator to our esteemed clients. It is one of the most common electrical appliances and there always is a Fan Regulator with every ceiling fan to control its speed.